You may be entitled to medical benefits to treat a workplace injury or illness. 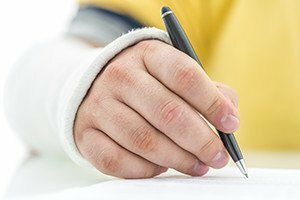 Under the Massachusetts Workers’ Compensation Act, injured employees can receive medical coverage for treatment related to harm on the job. Before you receive these benefits, your treatment will undergo a utilization review (UR) by the insurer’s agent. If the UR agent denies your request for treatment, the workers’ compensation attorneys at Pulgini & Norton can help you appeal the decision. We have guided many individuals in the Boston area through the appeals process. The Act requires all Massachusetts employers to provide workers’ compensation coverage to their employees. If a person is injured or becomes ill as a result of the job, he or she may qualify for workers’ compensation benefits. This insurance includes coverage for injury-related medical treatment, wage compensation, and other benefits. The Act also provides a way for insurers to manage the treatment of medical care for injured workers. A medical plan to treat a job-related accident or illness must undergo what is known as a utilization review. This is the process by which the appropriateness of the medical treatment is evaluated under the circumstances. Your employer’s insurer will designate a utilization review agent, or UR agent, to determine whether the proposed medical plan to treat an injury or illness is reasonable and necessary. Your medical provider will submit the proposed plan to the UR agent, who will consider the usual protocol for treating the particular disability. For instance, the UR agent may determine if physical therapy, surgery, and certain diagnostic tests are part of the medical treatment typically used to treat a specific type of injury or illness. If the UR agent considers the proposed medical treatment unnecessary, you or your medical provider can appeal the determination by calling or writing the UR agent. He or she will then have to contact another medical provider in the same field to assess the treatment proposed by your medical provider. If the UR agent denies the proposed treatment after the peer assessment, you will have to appeal the denial to the Department of Industrial Accidents (DIA). The UR agent may find that the proposed medical treatment is reasonable and necessary, but this does not guarantee you benefits. Once the UR agent determines that the plan is appropriate, the insurance adjuster has to decide if your injury or illness is related to your work. You can seek medical treatment under the proposed plan only if the adjuster finds that your injury or illness is work-related. If, however, the adjuster determines that your condition is not work-related, you will need to appeal to the DIA. You will need to file a claim with the DIA to begin the appeals process. Once the claim is filed, a conciliation meeting is scheduled between you, the insurer’s attorney, and a DIA representative. The goal of the conciliation is to reach a voluntary agreement between you and the insurer. If no agreement is reached, the case is referred to a judge for a conference. Both you and the insurer will submit documents to the judge regarding the case, such as medical reports. You will need to show that you were disabled, that the disability is work-related, and that any medical bills in dispute were for treatment that was necessary. Based on the evidence presented, the judge will either order the insurer to pay your medical benefits or decide that the insurer does not need to pay the benefits. A hearing will then take place if the judge’s decision is appealed. Our attorneys can advise and represent you at every stage of the appeals process if your claim for medical benefits is denied. At Pulgini & Norton, our work injury lawyers are dedicated to thorough representation and detail-oriented client service. If your medical benefits were denied after a utilization review in the Boston area, we can assist you in appealing the decision with the DIA. We offer our services to clients in Lowell, Medford, and Newton, among other Massachusetts communities. Call us at 781-843-2200 or contact us by filling out our online form to schedule a consultation.